Buy your tickets now online at www.samhughes.org. Don’t delay as this tour sold out two years ago and it is held only every 2 years. You can pick up your tour brochure (entrance ticket) at Arte de La Vida, 37 N. Tucson Blvd. 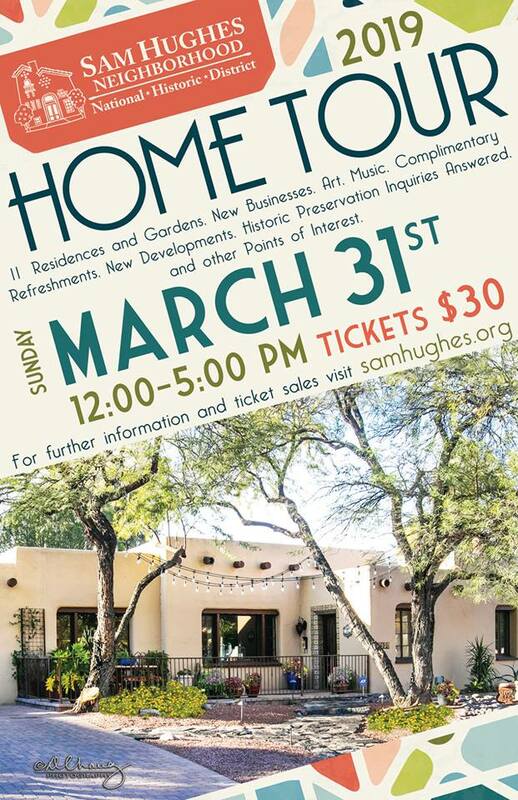 till March 30, then on the day of the tour in the parking lot west of Himmel Park library, 1035 N. Treat Avenue, Tucson, from 10 a.m. to 3 p.m.
Popular home/neighborhood tour today — don’t delay in picking up your brochure ticket starting 10 a.m. at Himmel Park library parking lot (west of the library), as tickets are selling quickly online. Weather promises to be sunny for the Spring. UPDATE: Hundreds of people on this tour again, visiting 11 eclectic homes, from 1928 vintage one (looks like a jail from outside) to super renovated ones, to classic SW styles. The UA President’s home at 2141 E. 3rd St. was on the tour for the first time. I biked, walked, drove thru the tour after I got a flat tire on the bike, had to then walk home, and later drove the car to the farther homes.